I have fresh cucumber recipes, and not all of them are salads. My recipes include cool, crunchy salad recipes, old fashioned pickle recipes - including canning instructions; fresh salsas, relish and dips. Slicers, or salad cucumbers, are the most common type to use in cucumber recipes. Pickling varieties are smaller and squatter then their slicing cousins, with thicker, bumpier skins and are usually harder to find. 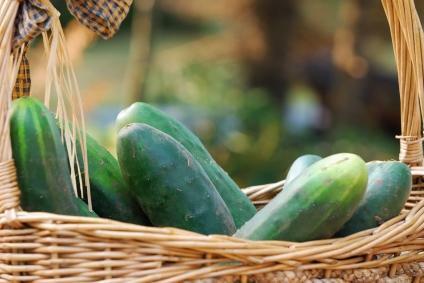 Greenhouse cucumbers, also known as English or "burp-less" cucumbers, are seedless and milder in flavor than field-grown varieties and can be substituted for slicers in any recipe. Keep unwashed cucumbers in the refrigerator crisper until ready to use in a cucumber recipe. Un-waxed cucumbers should be peeled; slice off the ends first to make the job easier. Removing the seeds (there is no harm in eating them) is a matter of personal choice. Cucumbers add texture and crunch to some fresh cucumber recipes like sandwiches and salads - and can be used to create delicious summer soups like gazpacho. They are also a cool complement to fish and poultry dishes. Cucumbers are 95% water. They have minimal nutritive value, but also minimal calories. These cucumber facts are brought to you courtesy of Whole Food Markets. Toss the cucumbers and onions together. Whisk the remaining ingredients in a separate bowl and then add to the vegetables. Chill for at least 3 hours before serving. Put the sliced cucumbers in a colander and sprinkle with the salt. Set aside to drain for one hour. Whisk together the vinegar and sugar until dissolved and add the sesame oil, garlic, ginger root and sesame seeds. Stir well. Rinse the salt off the cucumber slices and place them in a large bowl with the red chile peppers. Drizzle the dressing over the vegetables and toss to coat. Serve immediately. A fresh cucumber recipe that will be used often. I love crisp, cucumber recipes and this one is so tasty with the spices. Toss the cucumbers and onions in a large bowl. Quarter the tomatoes, remove the seeds and dice. Add to the cucumber mixture. Thinly slice the green pepper and add to the bowl. Toss lightly. Mix the last 5 ingredients together and add. Toss lightly to coat and refrigerate for 2 hours before serving. *The cucumber cut is very important to this salad, if thinly sliced the cucumbers will wilt and not be crunchy. 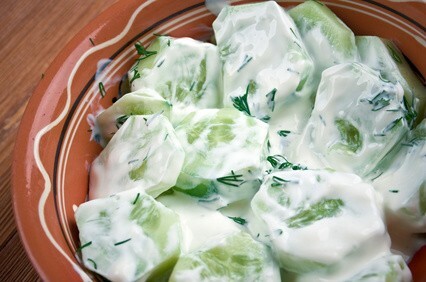 Great fresh cucumber salad in the summer. This is a wonderful cucumber recipe for dill pickles. Wash cucumbers and place in the sink with cold water and ice cubes. Soak for at least 2 hours, but no longer than 6 hours. Add more ice as needed. Sterilize eight 1 quart canning jars and lids in boiling water for 10 minutes. Now fill each jar with the hot brine. Clean the jar's rim with a cloth and seal the jar. Store pickles for 2 months before eating so flavors blend well. May be kept in a cool, dark place for up to 2 years. I recommend writing the date on the bottom of the jar when canning - to keep track of how old they are. Refrigerate after opening. *May substitute 1/3 TBS of dill seed for each jar. **At this point you may add in each jar: jalapeno pepper sliced with seeds, 1/8 tsp dry mustard seed, 1/8 tsp dill seed and 1/8 tsp celery seed. These pickles are my favorites - wait till you taste them. Soak the cucumbers in ice water for at least 6-8 hours before slicing. Thinly slice the cucumbers and onions and put in a large pail or tub. Add the green peppers, garlic and salt. Set aside for 45 minutes to 1 hour. Meanwhile in a large pan, mix the brine ingredients together and bring to a boil. Drain any liquid from the cucumber mixture and rinse well, and then add to the brine. When the brine is almost boiling for the second time, take off the heat and put in sterilized jars. Seal and chill in the refrigerator. A simple fresh cucumber recipe. This is a lovely and refreshing salsa; a delicious change from tomatoes. Excellent with grilled chicken, pork or fish. If you want more heat, leave the seeds in the jalapenos. Toss together the first 7 ingredients. Then season with the lime juice and zest; salt and pepper to taste. Refrigerate overnight for best flavor. I love this Greek sauce on gyros and you can also use it as a dip and salad dressing. You may also use grated onion if desired. Line a sieve with double thickness of a dampened cheesecloth. (Two coffee filters work well also.) Spoon in the yogurt and set the sieve over a bowl. Refrigerate for two or three hours or until yogurt is half of its volume - thick and creamy. Shred or finely chop the cucumbers and place in a colander over a bowl or sink and generously salt them. Let sit for at least 30-60 minutes. Rinse and gently pat dry. With a mortar and pestle muddle the garlic into a bit of salt and add to the thickened yogurt. Then add the cucumber, lemon juice, olive oil, pepper and mint. Mix well and chill overnight for best flavor. Stir again before serving and add some more chopped mint on top if desired. In a small bowl beat together the cream cheese, Italian dressing mix, mayo, sour cream and fresh dill. Salt and pepper to taste. Place dip on cracker and top with a slice of cucumber. Garnish with more fresh dill.